Kenyan minister says that Israel is one of the countries assisting in a forensic investigation of the terror attack on the Westgate mall. Kenya said on Wednesday that Israel was helping it with a forensic investigation into the weekend attack on a Nairobi shopping mall. The country’s interior minister, Joseph ole Lenku, told reporters that the United States and Britain were also taking part in the investigation. "We have moved to the next phase," Lenku was quoted by Reuters as having said, adding agencies from Germany and Canada as well as the police agency Interpol were also assisting. He added he did not expect the death toll, now at 72, to rise significantly and only expected to find more bodies of slain assailants. Earlier in the week, reports were circulating that a team of Israeli military advisers were flown in as early as Sunday morning to help Kenyan security forces root out Islamist terrorists and rescue the remaining hostages. 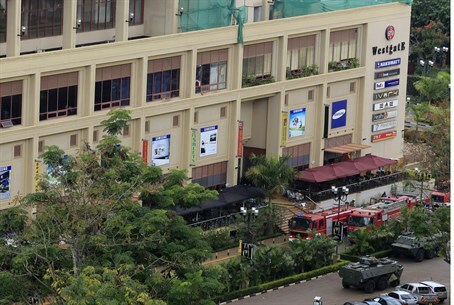 On Tuesday night, Kenyan President Uhuru Kenyatta said the bloody siege at the Westgate shopping mall was finally over. Kenyatta said in a televised address that five terrorists from Al Shabaab, an Al-Qaeda-linked Somali group were shot dead by troops with a further 11 suspects taken in custody. The Associated Press reported on Wednesday that Al-Shabaab had claimed that the Kenyan government assault team carried out “a demolition” of the building, burying 137 hostages in rubble. A government spokesman rejected what he described as “wild allegations” and said Kenyan forces were clearing all rooms, firing as they moved and encountering no one. “Al-Shabaab is known for wild allegations and there is absolutely no truth to what they’re saying,” Kenyan government spokesman Manoah Esipisu told AP.